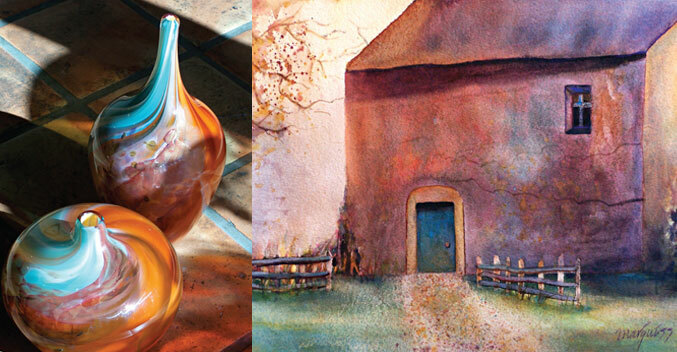 Summer is in full swing and our August exhibit offers a calm respite—Cool & Hot—Watercolors and photographs by Mary Marquiss and Nancy Becker’s hand-blown glass. Mary recently spent time in Provence, France and her work captures the warm earth hues of the buildings cast against the rich, strong blue of the sky. Nancy has picked up those colors in some of her most extraordinary glass yet. The exhibit opens during the First Friday Gallery Walk Aug. 6 from 5-9 pm and continues through the month. Don’t forget to take advantage of the Green Energy FREE shuttle service—it makes a lap between all Bend galleries every hour stopping in front of TAC at approximately 5:40pm. For more info see this month’s ARTS ON! available at any local gallery. Tumalo Art Co. is once again bursting with a diverse selection of art from your favorite artists in every medium and style….come and see us!